Symptoms: oh man, too many to list? I am pretty uncomfortable at this point. Little miss is head down and pressing on my bladder and intestines. You can imagine the discomfort this leads to. I've talked to my doctor about some of my discomforts and she told me they will likely stick around until after she comes...lovely. Best Moment of the Week: My sweet friend Lisa allows my other friend Amy and I to use her pool while she is at work. It's been so nice to cool down and escape the heat! Amy is due August 6th with a boy so we are just days away! Movement: The stomach is making movements that are extra terrestrial like! Wedding Ring on or Off: Still on surprisingly! What I am Looking Forward to: That moment we start calling people to let them know we are on our way to the hospital! Labor Signs: Started to dilate already (sorry tmi?) but doctor said that I could stay that way for weeks. Nursery: Still waiting on that damn ladder! He's almost done and to his credit he works on it in the garage and it's freaking HOT in there. I don't blame him for taking his time! Emotions: Ugh, discomfort can make me pretty miserable these days but I am trying to grin and bare it to the best of my abilities. Not too much longer! Love that you were committed to getting a picture each week. Wish I did that with my kids. You are in the home stretch! Looking good!! Yay!!! You look amazing and so happy!! You can see the light at the end of the tunnel! Hang in there sista! So happy for you making it to full term! Hope those nasty symptoms go away sooner than your doctor predicts! Congratulations doll!! So excited for you and can't wait for mini to arrive!! Looking great!! I've been dilated to 1cm for 2 weeks now haha I have a doctors appt this morning so we'll see if I've progress at all from that. Probably not though.... this baby doesn't seem to be wanting to come out anytime soon. I'm so excited we are all going to have our babies around the same time and I can bug you when I have questions and have no idea what I am doing haha! Look out for emails in the near future! Love that dress! You are one gorgeous preggy lady! Ahhh the home stretch! Hoping she comes soon for you!!! You are so cute, and how lucky that watermelon is your #1 craving! I hope mine is the same when I'm pregnant! ANY DAY NOW! Aah so exciting. That's amazing your friend lets you ladies keep cool in her pool. Key this time of year I'm sure! I am so excited for you!!!! You look amazing, and it sounds like you're doing pretty good considering ya know, you're about ready to pop! I already pee multiple times throughout the night and it's SO annoying...makes me kind of nervous what this could mean for pregnancy for me one day! Maybe it just means I'll already be used to getting up at 2am to pee? Ugh. aww. so sweet. Time flies I'm sure! Love how you were able to take these photos throughout the pregnancy! you look amazing!! and at least you're craving something healthy! Yay!! Better watermelon than chocolate, right?! So excited for you! BEAUTIFUL-- maybe it's my favorite bump lic yet. I love your dress!!! 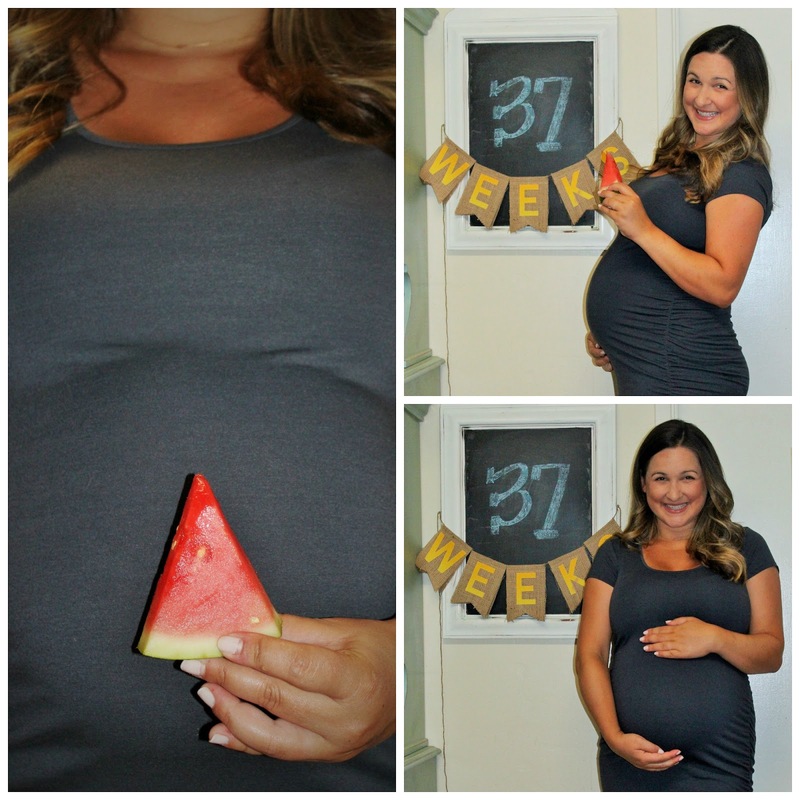 Your due date is so soon! Eeeek! I'm so excited for you and can't wait to hear about her arrival! :) Also, you're so dang cute pregnant!